« Free Veggie Tales Silly Songs 5 Songs! 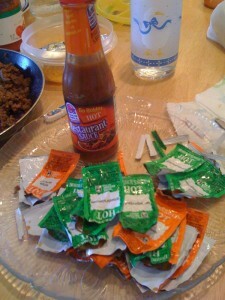 It takes 35 Taco Bell hot sauce packets to fill up a bottle of Taco Bell Hot sauce! Take all those extras you get when you eat out and put them in a bag for later! They add up quick! !